Stomach cancer is when malignant cancer cells form in the wall of the stomach. Malignant cancer cells are abnormal cells that have not only lost control over how they grow, but can also spread in the human body. The most common form of stomach cancer occurs in the innermost layer of the stomach called the mucosa, which has glands that produce fluids that break down food during digestion. This type of cancer is called “gastric adenocarcinoma”.  Other less common types of stomach cancer include gastro-intestinal stromal tumours, which develop in the connective tissue in the stomach wall, squamous cell carcinomas and carcinoid tumours. Linitis plastica is a less common type of adenocarcinoma which spreads to the walls of the stomach wall and makes it thicker and more rigid. The stomach is an organ in the upper abdomen that helps digest food and absorb any important nutrients before the food moves to the intestines. There are different layers of tissue in the stomach wall that help in the digestion and absorption process. Stomach cancer is a slow-growing cancer that begins in the stomach lining and, if not detected early, can spread to the outer layers of the stomach. Afterwards the stomach cancer can invade through the stomach wall and enter the blood stream or lymph nodes. This allows stomach cancer cells to spread into nearby organs such as the pancreas and bowel and other parts of the human body. Early stages of stomach cancer are rarely detected as they may not cause symptoms or only show in the form of non-specific symptoms such as mild indigestion which can be commonly found in other illnesses. Most diagnoses occur when stomach cancer is in advanced stages. Worldwide stomach cancer is the sixth most common cancer type and the third leading cause of cancer deaths. 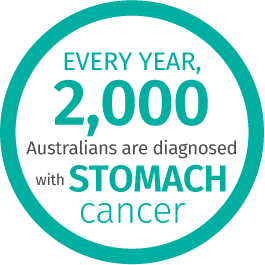 In Australia, around 2,332 people will be diagnosed with stomach cancer in 2018. Males are approximately twice as likely as females to be diagnosed with it. Individuals with stomach cancer have a 29.5% chance of surviving past five years after their initial diagnosis. Many factors can increase the risk of developing stomach cancer. The type of diagnosis or tests will vary depending on symptoms. Common tests include blood tests or examination of stool samples. The medical practitioner may also use X-rays, computed tomography (CT), Magnetic Resonance Imaging (MRI) or endoscopy to examine the stomach and surrounding organs in more detail. An endoscopy allows the doctor to examine the upper digestive tract and inside of the stomach by using a thin flexible tube with a camera. During the procedure, the doctor may also take a small sample of tissue called a biopsy. The tissue sample will then be examined under a microscope to see if there are any cancer cells. Scans of the stomach and nearby organs may be performed to create a clearer picture for doctors to see if there is any evidence of stomach cancer. This can include X-rays, computed tomography/positron emission tomography (CT/PET scans) or MRI. Surgery is the most common treatment for stomach cancer. However, this depends on the location of the cancer and whether it is at an advanced stage. If a stomach cancer is detected early, surgical removal of part or all of the stomach will be performed to remove cancerous tissue. The amount of stomach tissue removed during surgery depends on how the location of the cancer and how extensive the affected area is. Chemotherapy and radiotherapy may be given during or after surgery to kill cancer cells. Chemotherapy and radiotherapy may also be recommended for cases of advanced stomach cancer when surgery is no longer possible. Currently, there is no standard screening test for stomach cancer in Australia.